We are a leading Manufacturer of milton roy dosing pump from Surat, India. We have gained huge recognizance as major manufacturer and supplier of finest quality Milton Roy Dose Pump. Our offered pumps are equipped with electronic diaphragm for increased working efficiency and effective cleaning of water in filtration plants. These pumps are made available to customers in varied specifications to suit variegated needs of customers. High in durability and precisely designed, these pumps are offered to customers at reasonable price tags. We are offering precision engineered range of Chemical Dosing Pump which are widely appreciated for high efficiency and longer service life. These are innovatively designed for continuous operation in Water Treatment Plants. 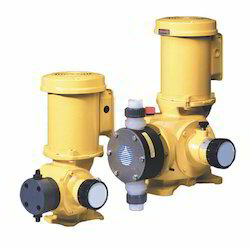 The Chemical Dosing Pump are suitable to be used in different chemicals such as acids, alkali, chlorine and antiscalant.